Fishing Pole Rod Trolling Deepsea Saltwater Freshwater Big Game Lite Fiblink! This incredibly strong Saltwater Offshore Rod is built on top-quality, extra-tough E-glass graphite composite blanks, specifically designed for applying maximum pressure when battling huge saltwater fish. 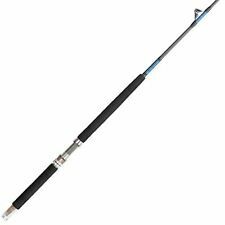 4 out of 5 stars - Fishing Pole Rod Trolling Deepsea Saltwater Freshwater Big Game Lite Fiblink! 5 product ratings5 product ratings - Fishing Pole Rod Trolling Deepsea Saltwater Freshwater Big Game Lite Fiblink! Lightweight, rod weight: only 18.3oz | Line Weight: 30-50 lbs. Main Specifications: Length: 5'1" Power: Heavy Line Weight: 30-50 lbs. | Rod Weight: only 18.3 ounces Line Weight: 50-80 lbs. | Rod Weight: only 19 ounces Line Weight: 80-120lbs. Main Specifications: Length: 5'1" Power: Heavy Line Weight: 30-50 lbs. | Rod Weight: only 18.3 ounces Line Weight: 50-80 lbs. | Rod Weight: only 19 ounces Line Weight: 80-120lbs. | Rod Weight: only 27.95 ounces Guides: 5 Pieces: 1 Key Features: 1.Top-quality, extra-tough 1-piece tubular E-glass graphite composite blanks, with a parabolic taper specifically designed for applying maximum pressure when battling huge saltwater fish. Fiblink® Warranty: One Year Warranty. This incredibly strong Saltwater Offshore Rod is built on top-quality, extra-tough E-glass graphite composite blanks, specifically designed for applying maximum pressure when battling huge saltwater fish.